For those of you who have stumbled across this blog in search of information about thyroid surgery, hopefully this page will make things a little easier to navigate! In December 2010, I had surgery to remove my overactive thryoid. 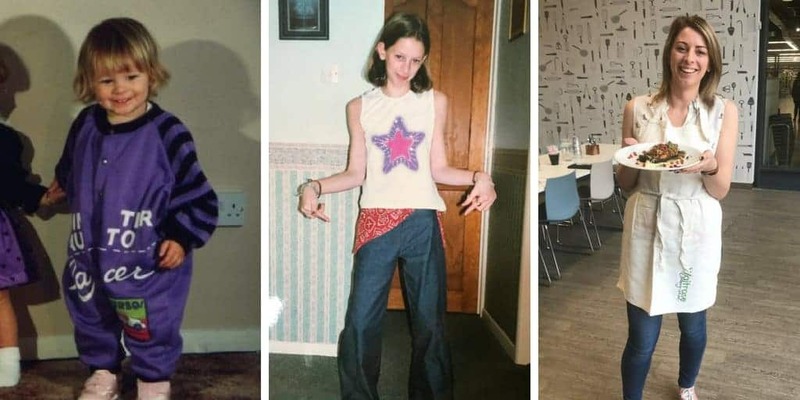 Thyroid conditions have often been linked to coeliac disease, and having suffered from hyperthyroidism for as long as I can remember, it has been a big part of my life! Before having my thyroid removed I was on medication for years, it then went into remission before becoming overactive again. This time, I decided I wanted it out! Before my operation I was in a blind panic of googling and after not being able to find much information on people’s personal experiences of the surgery, I was a nervous wreck. I have created this page in the hope that if you are going through thyroid surgery or have just had an operation, it might put your mind at ease a bit! Here’s all my thyroid related posts so far (will keep updating as and when I post – newest at the top!)…. Another month gone by with no thyroid! For those of you who want to see the gory details (If you’re having/had the surgery I know you’re dying to see what the scar looks like!) here’s some images (which I hope to update regularly!) on the progression of my scar. For those of you who are a little squeamish, look away now! 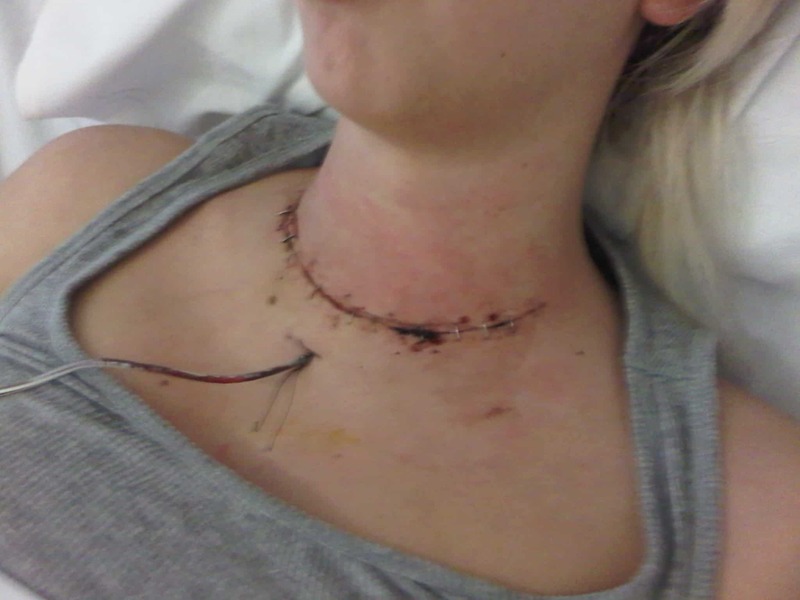 20th Dec 2010 – Back home, staples are all gone and there’s a bit of bruising! 6th Jan 2011 – been using the bio-oil and it’s looking heaps better already! 8th Feb 2011 – nearly 2 months after surgery and people already don’t notice my scar until I tell them, though to me it’s still so obvious! 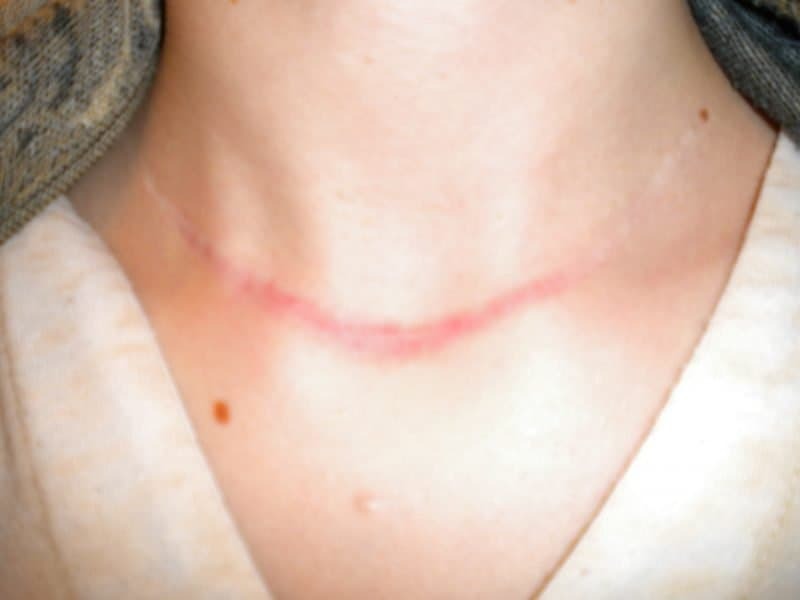 12th March 2011 – Three months (ish) after my op and I’m really noticing how differently shaped my neck is!? 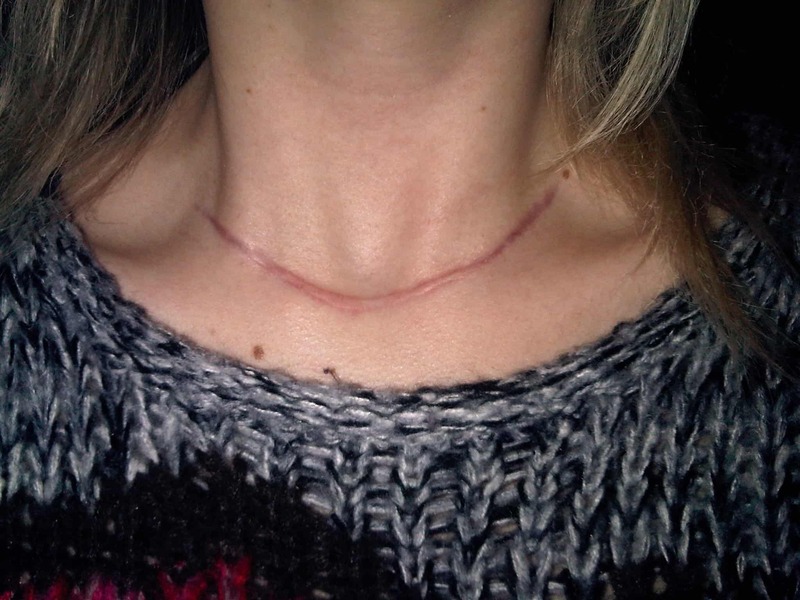 21st May 2011 – five months on and you can barely see the ends of my scar – it’s healing amazingly well! 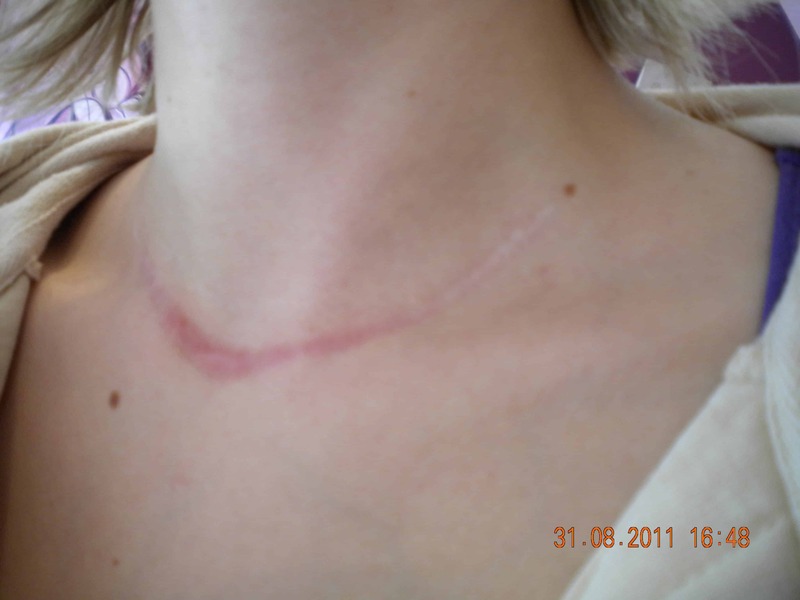 31st August 2011 – 9 months on from my op and my scar is so much better! Hey, I’m going in to have mine out this Wednesday (4/27/11) and I’m pretty anxious. I imagine it felt a little strange put the pictures of it up, but it was kind of nice to see what I can expect “visually”, so I appreciated it. i have to have an operation to remove my thyroid gland as i have a nodule that could be cancerous. i dont want to have the op, i cry every single day in fear of having the op, things going wrong and fear of lkeaving my 5yr old son cuz im so scared of dying. i cant eat or sleep, i just wish i didnt have to have the operation done, im so scared and so upset, ive put the operation off for months but i know i have to face up to it and have it done! I’m do for surgery soon and feel just like you did.Just wondering how your surgery went? I hope all is well. Hello first I would like to say Thank You for your time and your journey! I’m a 2 week old just had surgery and doing good!! My ? is the weight , did you gain or loose weight??? 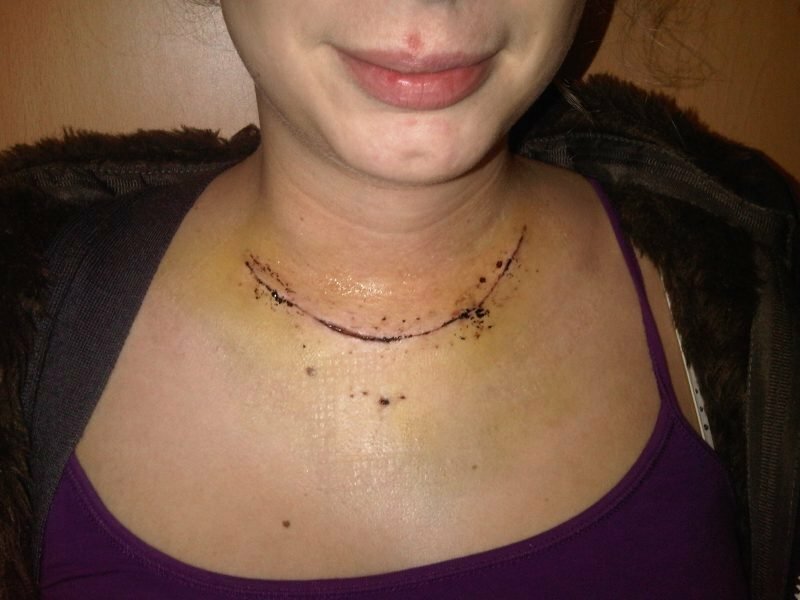 I had thyroidectomy for cancer, 12 hours of surgery but my scar wasn’t near as large as yours. Just wanted to let people know it might not be so large. Hello how are you? I hope your okay! Can I ask you something about thyroid hormone therapy? Hello Everyone. Do you know anyone who is a thyroidectomy patient? Pls skype me at larznicdelcasquejo@gmail.com (larziano20). I love your site, puts me at ease! How big was your goiter? Im having surgery in 5 days and my goiter is 11 cms! Im super terrified about the breathing and drain tube, but i cant wait to have this huge mass removed. 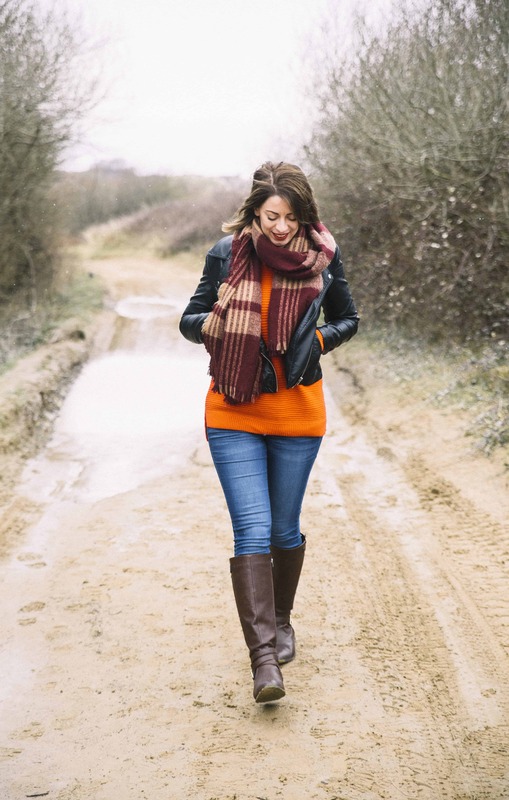 Chrissy – how did it all go? Went pretty good, although finding the right dose is the real struggle now. Good to hear it went well Chrissy. So you had an 11cm Nodule – do I have that right? Mine is massive and I pretty much have myself half in the grave envisioning mets to the lungs and such. I’m 56 tho. Lisa you will be fine! I had a distant friend that had worse, the cardiologist had to get involved. She is fine now. 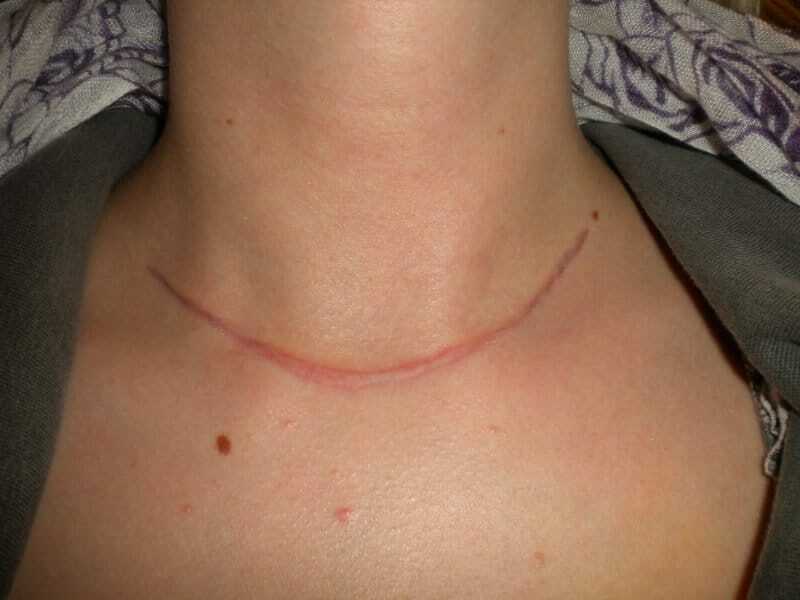 I had a Thyroidectomy on May the 12th, Less than 2 months later I had an appointment with my surgeon on July the 10th and he was amazed to see that my scar is almost none existent. For two months I was using the Dr Max Powers Scar Serum and it worked. The surgeon was surprised and even wrote down the name of the Scar Serum to recommend to his clients. Your scar looks like a smiley face! =) — That sounds rough, what you went through. As nurse, I can only imagine how unnerving that must have been. Lucky me, I haven’t ran into any thyroid issues yet, however there seems to be a family tendency for it. I hope you are doing well!!! See an endocrinologist if your not. Tell him/her all of your symptoms. No matter how small. I waited 3 years to see an endo after having 2/3 of my thyroid removed, big mistake. Have more health issues now then ever. Hi, I had my thyroid removed 13 years ago at the age of 14 due to Hyperthyroidism. I was just wondering what dosage of thyroxine do you take? and do you have any side affects? I currently take 200mg but feel like I am having hypo symptoms even on this amount. Sorry to hear you feel worse! I am doing a full update soon on my current situation, but I’d definitely recommend you speak to your doctor! Thank you so much for your post. Having a total thyroid removal next Friday and have had issues with Gluten for years (tested negative as will not go back on diet long enough to diagnose – get too sick). I have a nodule that tests as either cancerous or per-cancerous (will know after surgery) so whole thing is coming out. Having the pictures helps so much as my imagination was driving me crazy. Never even imagined there was a connection! This is great! I had my first half out in 2013 with a 4cm lump of cancer and had a horrible recovery and the second half came out 6 months later and I was petrified. Thankfully the recovery was a breeze compared to the first. I am still struggling with my weight due to having no thyroid even though my levels are bang on. I can’t seem to lose the 40lbs I gained after all was out. I can’t eat barely anything or i balloon. I don’t know what to do. Hi Sarah – I have a pretty big goiter that makes it difficult to swallow food and am considering surgery as an option. Im also Hashimotos so my food intake is very limited right now. After your surgery were you able to eat everything again or do you still remain gluten free (or any other diet).